Session 233. 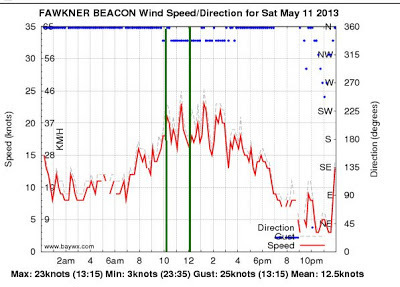 I headed down to Brighton at 8am to meet Cesar and catch the forecast northerly. Cesar is organising a "Across the Bay to Conquer Cancer - reverse" so we are doing some training for that. There was about 5 knots of wind so Cesar headed back home while Stuart, James and I had a coffee at the Brighton Baths. When we got back to the beach we could see some wind coming across the Bay from the north so we rigged up and headed out. 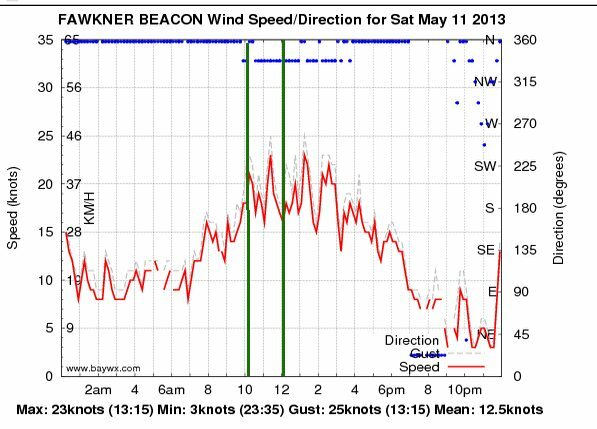 The wind was consistent offshore but not so good closer to the beach. The Sector 60 was moving along quite nicely. Its been a while since I have used the Sector 60 so I had to re-acquaint myself with turning it and swapping my feet in gybe turns. When Cesar came out we headed off for an upwind tour, making up past Elwood. We passed a few small catamarans racing. The race boats were nice to see to, in case we got stranded with no wind. I was a bit concerned about losing the wind so we headed back with some fast runs. I had a few high speed stacks that were quite exciting, then starting doing fast turns at speed down-looping the kite. The Lithium 12 provides nice smooth power with the down-loop turns. Back at Brighton quite a few more kiters were out. One person dunked their kite and then started a self rescue. I headed out to offer some help but by the time I went past they were close to th reef and headed for shore. I did a few jumps on the Sector 60. Once I got used to the extra weight of the board I was able to get a bit of height. My fastest speed was 41.7 km/h and I logged 41 km distance . The water was fairly warm and the weather was warm and sunny. This was a really good session after 2 weeks off the water.